The supposed John Johnson stands eerily at the back of the group. The story goes that a paranormal investigation was being held at a local Toys R Us. The investigators were asked to sit down by a local psychic, Sylvia Brown. As she spoke to the ghost she obtained the information the ghost's name was John or Johan Johnson. He was a mentally handicapped worker on a ranch at the current site of the store. He was smitten with Elizabeth Yuba Murphy Tafee, daughter of the owner. His love was not returned and he died of a fatal accidental leg wound. To this day none of the information has been clarified. The picture was taken on infared film. Since all people were asked to sit, there was a lone man standing in the background of the picture with hands stuffed in his pockets. Nobody had seen him at all. OMG guys! I saw this story featured on an anthology show in the mid 1990's and I can't figure the name out! The other stories I remember was the haunted school and the haunted hotel room with the eyes on the tv, even when the tv was unplugged. Does anyone know what this show was called? I really want to watch these spooky episodes again! Thanks for any help. ...another photo taken at the same time with regular film, by an assistant photographer standing next to the infra-red photographer (Bill Tidwell) -- shows no one standing where the man is standing. 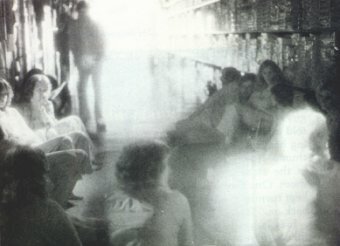 I have misgivings about Sylvia Browne as well, but there were a great many people present when this photo was taken, and there is also the evidence of the other photo taken at the same time, and at nearly the same angle, which shows no one standing where the man is seen in the infra red photo. If it is a hoax, all the people there had to be in on it. Source of my information: The Ghostly Register, by Arthur Myers: Chicago, Contemporary Books, 1986, pp. 52-57. Sorry about my comment but I think this is fake. I believe in ghosts and I have seen, heard, and felt a ghost touch me in my house but this picture looks fake. I have caught a host on camera once and that was real. The first time I saw this picture, I saw the man in the back and he looks 100% real. Once again, I am sorry about not believing you but this looks very fake. Check your facts, this is in fact in Sunnyvale, CA. I strongly disagree with any skeptic(s) regarding this visual which to me is CLEARLY an authenticated ghost "capture". Reason being is that, again, to me, this "person" in the background just doesn't appear right. His body is eerily disproportioned(extremely thin lanky appendages,very small disproportioned head, etc....). If you research various full body apparitions in pictures, you will quickly notice all of the disproportion. That's a tale-tell sign that what you have is an authenticated "capture" as opposed to a hoax or CGI. I was just a little girl when this issue hit the news of the San Fernando Valley in Southern California. Believe me this is no joke, it's the real deal! And supernatural stuff doesn't make the news out here often. One thing I would like to correct though it's "SUN VALLEY" not Sunnyvale lol. Google it! I am a young writer and I am pretty interested in the Haunted Toys-R-Us story, particularly about the ghost himself. Remember he lives in a toy store. He sees thousands of people everyday. So he sees the centuries change. Ghosts show themselves as they want to be seen. If you do look at the man he does seem to be talking to the other gentleman. I am not saying this picture doesn't show something because it very well might, but to "Anonymous" everyone is entitled to their own beliefs and opinions, no need to be rude to anyone. And btw you can't believe everything that is written on Wikipedia. You could go in there today and write something on Sylvia Brown and people would believe it. Anyone can put anything on that website. I do believe that you need to site your sources and also tell us who you are if you are going to denounce anything that anyone says. To the original poster cool pic! She was never convicted of fraud. Just because you don't believe her doesn't give you the right to bash her as for the pic and all ^^ wickedness. I have done a little looking in to that one myself and that story has always intrigued me. i saw this in the 80s "thats incredible" tv show, and is well explaint, this picture and the story. Just because "nobody saw him" doesn't mean that he didn't walk up, see what was going on, and walk off quietly. Also, if you look closely, the very last man (furthest from the camera) on the right side of the aisle, in the middle of the photo, seems to be holding up his hands and talking to the man. Yep, I see exactly what you were saying about her. Cool. Most of the information he said could be found on an wikipedia page about Sylvia Brown. As for the information regarding the psychic reading on the man that was not seen, the source of my information said otherwise. Regardless of the true details, since we may never actually discover them, this picture is quite spooky. You seem to have lots of facts about this story. Could you please reveal to us your sources? Also, if you are so factually denouncing this story, why aren't you telling us who you are? I'm not being combative, it's just that what you're doing is a bit unusual. I also wanted to add that this supposed ranch that exsisted before the toys R us...according to the historical documents said ranch never exsisted. It also should be mentioned this "Johan" was from the late 1800's to early 1900's. But look closely at the picture, he looks like he is wearing a jacket, a shirt, pants which appear to look bell bottomed. I remember hearing something about this. This was an investigation conducted by well known psychic Sylvia Brown. I've done my research on Miss Brown as I myself personally didn't have a good feeling about her. She told a couple that their kidnapped child was dead when in fact he was alive living with the man who had kidnapped him. I believe in psychics but Miss Brown is known for being a convicted felon of investment fraud and theft. She said this man in the pic was a preacher with a Swedish accent. So how is he a preacher who is mentally handicapped? It was also said he accidentally hacked but also said they found his body with an ax wound in the neck. If Sylvia is a real psychic her being a convicted felon of fraud will make other doubt her. That is an eerie pic and story!